I recently had the opportunity to road test the 2018 Cervelo R5. In this review I will outline the technical frameset changes to the all-new R5 – including its weight – and provide my perspectives on the rim brake versus the disc brake version. In addition, after recently road testing the ‘all new’ 2018 Specialized S-Works Tarmac SL6, I will provide a comparison between these two race bikes, ultimately providing the pros and cons to each performance machine. This will leave you with no fence sitting on which ride I’d personally prefer to walk out the door with. But before I get into the detail, I want to thank Bike Chaser dealers, Cycle House – for kindly allowing me to take one of their in-store R5s out for a 100 km road test – and then another dealer, Bikes at Brighton – who lent me a Disc model for further filming! 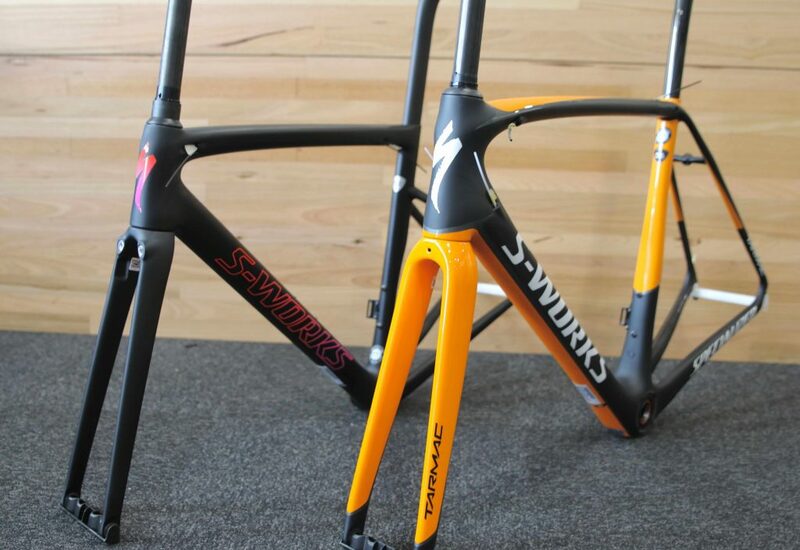 You can also check out the R5 , the new S5 and Cervelo’s entire road range at Croydon Cycleworks. I rode the Cervelo R5 solo in Victoria’s well regarded “hill climbing” area – King Lake – which provided a perfect testing ground to familiarise myself with this well-regarded race machine. Following the ride I spent a solid two weeks researching the Cervelo and comparing it’s technicalities to the Specialised Tarmac SL6. With a non-fence sitting conclusion towards the end of this piece I wanted to ensure I’d covered all bases. It’s the same bike. While Cervelo have provided different wheels and components to make it ride a little differently, the personality of the bike and the way bike brands differentiate is in the frame. The frame geometries and carbon lay-up are the same on disc versus rim brake versions. So having ridden disc disc before, let me quickly walk you through what’s going to happen with rim brake versus the disc brake versions. Disc brakes have better overall breaking performance, notably the braking power in the wet is far greater. And the modulation, which is the ability to control the force within the lever – is really quite exceptional. For me, modulation is the clincher when it comes to disc. Here’s the rim brake version, no disc structures to talk of on the left hand side of the bike. While disc brakes provide a better braking performance, they do create some drag and the aerodynamic loss from the disc is still up for debate. Disc brakes are less aerodynamics (how much, is up for debate), and while disc brakes themselves don’t necessarily weigh much more than rim brakes, you have different prerequisites with disc brakes. This includes different wheel, fork, and frame structures to manage the disc brake requirements. This adds some weight to the bike; around a few hundred grams. As mentioned, the two models from Cervelo – The R5 and the R5d – come with different set ups. The rim brake version comes with SRAM eTap and Zip 302 wheels, and the Disc version has Electronic Dura Ace Di2 with Enve 3.4 wheels. For the purpose of this review, however, I’d like to focus more on the frame. Because it’s ultimately the frame that really separates one race bikes to the next. So what makes Cervelo unique? I’ll get to that shortly. Specialized say: Nothing is Lighter, Faster, and has Better Handling. Cervelo say: we’ve redefined the classic road bike by revolutionizing three interconnected factors — comfort, fit, and handling/stability. There’s no doubting Specialized have put a lot of time and energy into weight and aerodynamics on their all new SL6. Including some new (released in 2017) Roval 50 deeper dish wheels. I’d have to say, both these statements appear to be true. Drilling a little bit deeper, both brands have definitely focused on fit, although through much different methodologies. This includes an enormous 8 mm of stack reduction – so riders can get lower –compared to the previous version. 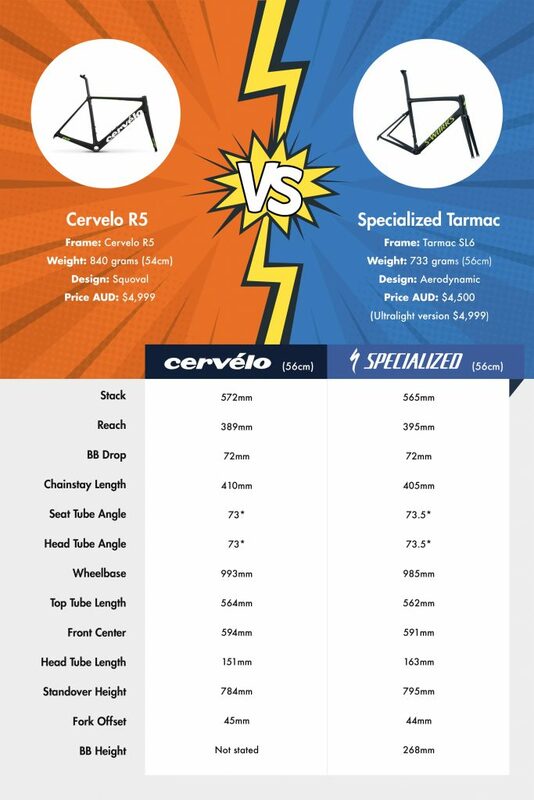 A 54 cm frame (which was the size that I personally rode) has a published stack of 548 mm, which falls between that of a Specialized Tarmac (543 mm) and a Cannondale SuperSix Evo (551 mm) on the same frame size. So still not overly aggressive, but this move has aligned to ‘fit’ feedback from team Dimension Data. One of Cervelo’s other key criterias was improving the R series handling and stability, which is ultimately centred around how the bike fits to a rider. 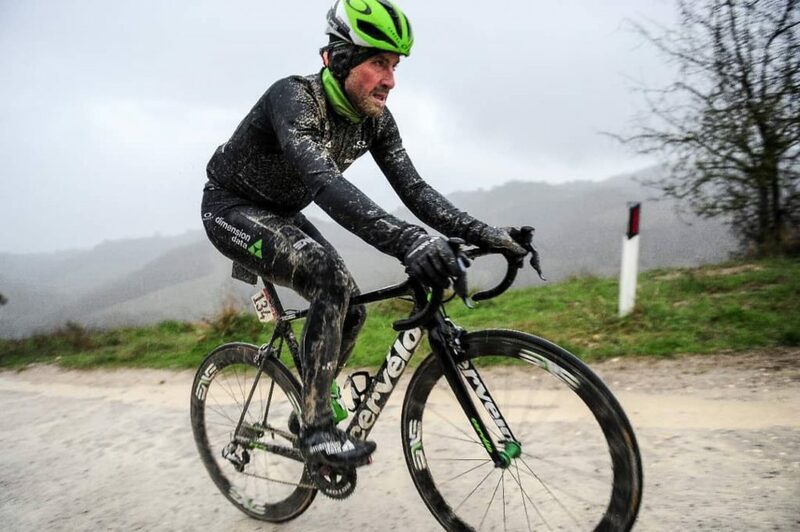 Bernie Eisel from team Dimension Data riding at the recent Strade Branche. 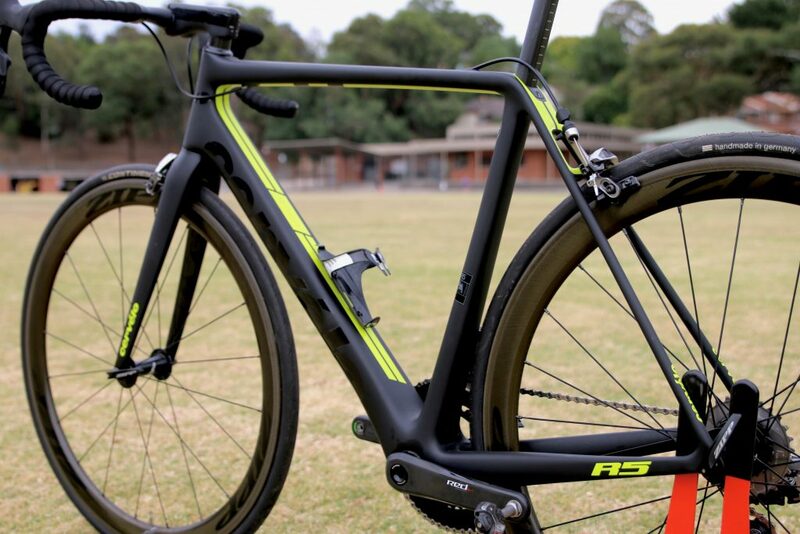 In the past, many of the Pros from team Dimension Data would be seen with stems reversed in order to get lower and become more aerodynamic on the bike. The lowered stack should mitigate this for pros while also not being so low that it will ostracise the regular amateur rider who wants to buy the R5. In order to do so, the bottom bracket height has been dropped by 4 mm (on a size 56) to 72 mm (exactly the same as the Tarmac) and the wheelbase increased by 8 mm, which turns out to the length it has over the Specialized Tarmac. These two features work in combination to lower a rider’s centre of gravity and provide a wider base of support. How did this impact the ride quality? The slightly longer wheel base gives the Cervelo a more grounded feel when rapidly generating speed down a descent and also cornering. Yet the longer wheel base also makes it less responsive when out of the saddle. They’re referencing a completely re-engineered frame or what they now call a “platform”, which is not so much based on feedback they’ve obtained from the professionals they cater for but more so from their bike fitting program Retul. Since 2012, they’ve been able to analyse over 40,000 bike fits from athletes that have completed a Retul fit and use that data to re-engineer their frames, to take what they call a “rider first approach”. For their performance range, men and women now even share the exact same frame. 2018 Tarmac SL6 on the left and the 2017 SL5 on the right, You can see much narrower forks and generally thinner frame. The seat stays have been lowered and the seat post is a very narrow D.
Interestingly, when you compare the geometries of these two race machines, there’s very little between them. I’m talking one or two millimetres here and there. I have provided a full comparison in the below table, using a 56 cm frame geometry. Where these bikes appear to differentiate mostly – to the naked eye – is in the tubing. Cervelo’s frame design is considered to be “Squoval Engineered” blending square on oval shaped tubes throughout the frame. 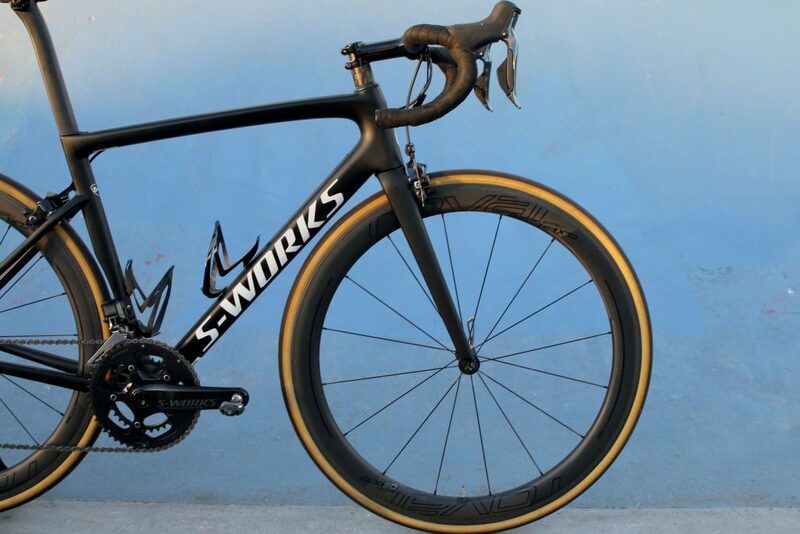 Specialized, on the contrary, have focused on more aerodynamic tubing and created a frame and there appears to be a lot less of it compared to it’s predesseor (the SL5) and also the Cervelo. Check out Bike Chaser’s range of Cervelo race machines. Check out Bike Chaser’s range of Specialized race machines. Specialized has also changed the seat stays by lowering them to create what they say is a more aerodynamic platform. 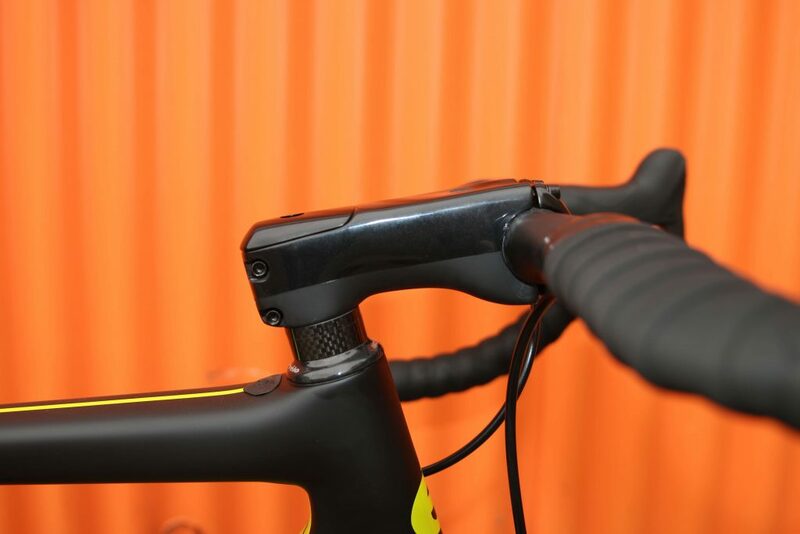 The Cervelo seat stay remains in its traditional spot (connecting in where the seat post enters the frame) and could be a reason why the Cervelo feels a little more comfortable. 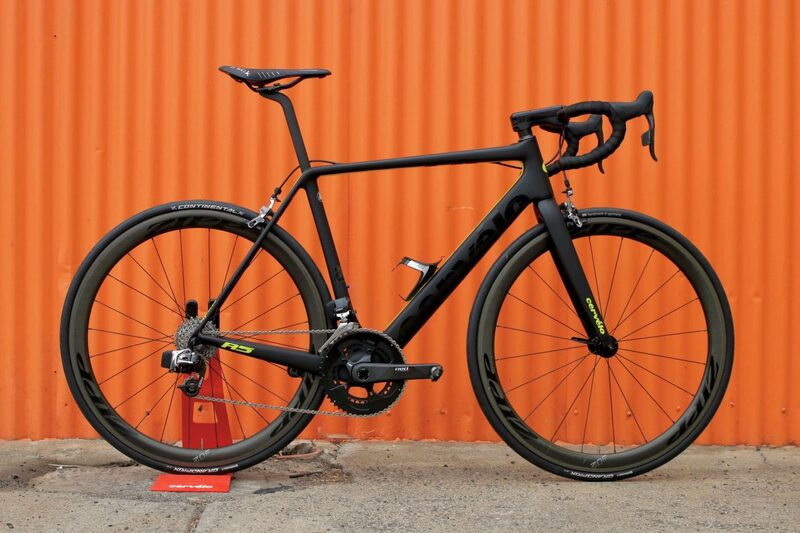 Both bikes offer an aero D-shaped seat post, reducing aerodynamic drag, although I’d have to say the Tarmac’s D-shaped post looks a lot more aerodynamic than the Cervelo. They’re both stiff, but who’s the stiffest? Specialized say the rider first approach is to ensure that the new Tarmac is stiff and compliant in exactly the right places. Cervelo say that their R series is now officially categorised as their “stiffest-ever road frames”. 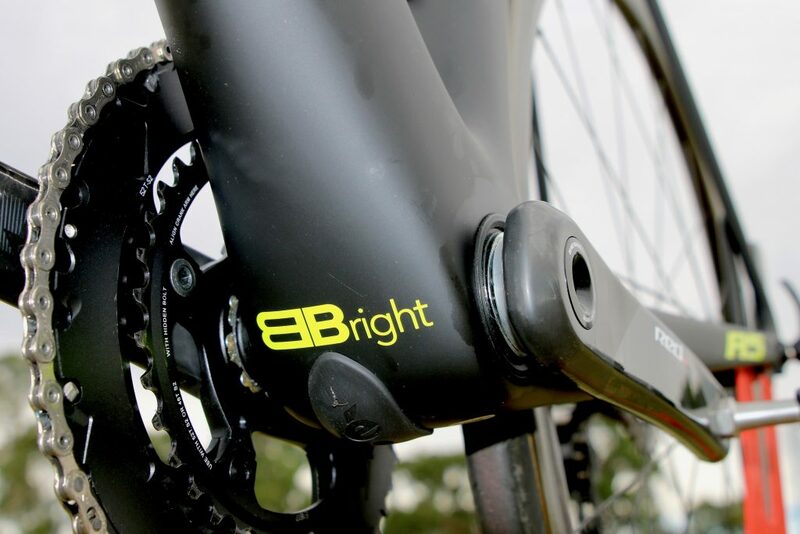 The bottom bracket is an asymmetrical design called “BBright” and it takes advantage of the fact that oversized frame tubes are stiffer and lighter. The left chain stay is notably thicker than the right side, which is designed to create a stiffer ride. The bottom bracket has been lowered to stabilise handling, making it 13% stiffer than the previous model. Also, 21% more stiffness has been added to the head tube. The bottom bracket is an asymmetrical design called “BBright” and it takes advantage of the fact that oversized frame tubes are stiffer and lighter. On the right side of the bike the frame tubes are already as wide as possible; any wider and they’d hit the chain rings. But on the left side there are no chain rings, so BBright makes use of this extra space by extending the bottom bracket shell by 11 millimetres, nearly doubling the width of the left chain stay. Specialized outline a stronger carbon fibre layup, separate fork dimensions depending on the size of the frame, and also more aerodynamic tubing throughout the bike, including dropping the seat stay, as the major improvements. 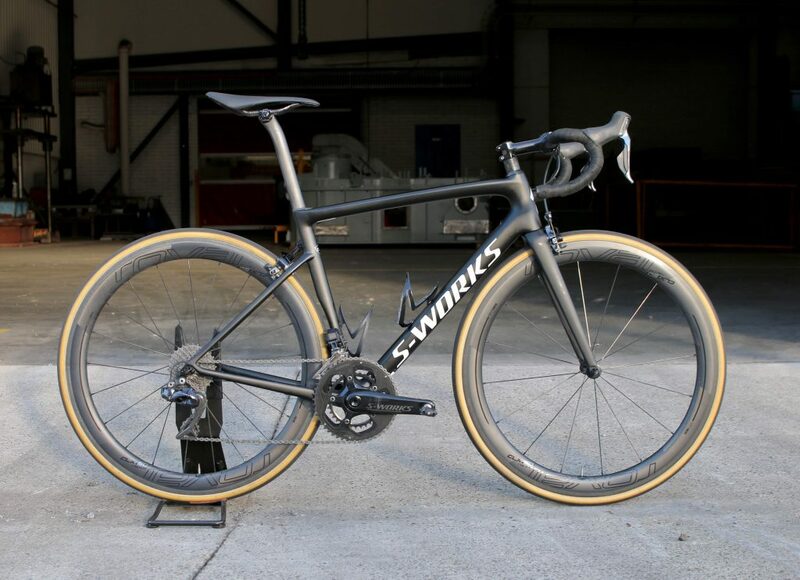 Furthermore, Specialized make additional claims that the Tarmac is more aerodynamic than the very first Venges that rolled off the production line, which is like saying the Cervelo R5 is more aerodynamic than the S Series was, say 5 years ago. Specialised pinpoint a new carbon layup, more aero tubing (especially the seat tube), a D shaped seat post, and dropped seat stays. I know stiffness can be broken into different categories if you want to go really deep, but for me it’s all about transfer of power. Power from the crank that is then efficiently utilised to propel the bike forward without any flex ruining all that hard work you’re putting in. The Specialized definitely feels stiffer. When you put the foot down – especially when out of the saddle – the Tarmac’s responsiveness is the best I’ve ridden. But I do wonder if it’s a bit of a false economy when we’re focusing specifically on stiffness. The Specialized have a shorter wheel base and the frame is around 100 grams lighter, so it’s naturally going to feel more responsive which doesn’t necessarily make it stiffer – but it certainly feels that way. One bike felt faster and more aggressive. The other felt more controlled from a handling perspective and made me feel like I could ride it all day long without any complaints. You can probably guess which bikes I’m talking about, right? Now I’m not saying the Cervelo wasn’t fast or that the Specialized was uncomfortable. I actually found the Tarmac more comfortable than its predecessor, the SL5 and I’d have no problems riding it for 100 km on end. But was it as comfortable as the Cervelo R5? No. To dig a little deeper into the comfort factor – the Pros won’t likely use the Tarmac for the Paris Roubaix. They’ll use the Specialized Roubaix. Whereas Team Dimension Data; they will be taking something from the R series all the way to the finish line. While the Tarmac felt like it had speed on it’s side, I still found the Cervelo super fast. It’s got aerodynamic attributes throughout the bike – including a Cervélo-engineered all-carbon aero stem and bar – and the Zipp 302 wheels added to the mix. Descending and cornering was also a pleasure on the Cervelo. This is the Cervélo-engineered all-carbon aero stem and bar. This looks great but some people have complained about the inability to have tubing rise above the stem bar, which can be useful for resale. But did it feel as fast as the Tarmac? No it didn’t. The Tarmac has been built with aero in mind and is lighter than ever before. The Roval 50s added onto the version that I rode created a super slice-through-the-air feeling and the downhill descents were so rapid I found myself feathering the brakes like never before. The cornering was aggressive on the Tarmac, and perhaps could be a little too much for some. If you’re going to ask me about my own personal preferences here, I’d have to say the Specialized Tarmac SL6. 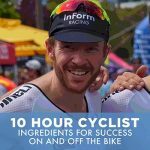 I race in the local A grade criteriums here in Melbourne and I need every bit of help I can get (so I don’t end up watching the final laps from the grass)! The aerodynamics and weight of the Tarmc make it feel super aggressive and ready to take off at the slightest ask. That’s for me. Some of you may not race criteriums and favour aerodynamics and weight gains. The Cervelo R5 definitely rides fast with incredible comfort and I’d say more elegant handling than the Tarmac. Whatever your riding style, these two quality machines offer incredible performance and eye-catching appeal. Looking for new cycling gear? Find everything Cervelo on the Bike Chaser marketplace. Did you like the sound of the Specialized? Find all Specialized products for sale on Bike Chaser. Good review, thanks for that. Both bikes look great but it looks as if Spesh has really pushed the bar on the Tarmac. I love a bike that has that hunkered down, stable feeling on high speed, straight line descents. Do you think the R5 is the better pick against that requirement? I know its a silly question to ask but I am in the market for new bikes and it so happen that these two are the one that I am considering but before i pull the trigger of dropping 10k usd on a bike. Also I am not planning on buying another bike after this (unless i get in an accident in which I pray wont happen or the bike is really old and its no longer functional). again thanks for your review. cheers! Very good review about those two super bikes, I want to change my old 2011 version tcr advanced sl, i have been doing a bit of research and I have the O2 factor and those two (R5 and tarmac) as options. I am characterized to be a short explosive climber. any recommendation i should hear from an expert like you would be awesome.